The other day, while doing my morning wanderings around my garden, I noticed that one of my beautiful Agave desmettiana variegata is beginning to develop a bloomspike. How tremendously bittersweet! It is the most awe inspiring thing that happens in my gardens – the blooming of the agaves – but since they are lost after their magnificent flowering, I can’t help but be a little sad. Especially for this agave – one of my favorites, who sits proudly next to my back yard vegetable beds, happily presenting her elegantly striped and arched limbs for me to enjoy while I plant, tend, and harvest. Like most of my agaves and aloes, this specimen is somewhere in between plant, sculpture, and person – there is so much style, grace, and wit about her I can’t help but think of her as a “her”. She is my ballerina agave – she manages to dance in her stillness. I know I’m going to get many more agaves from her death, and that this will be a gorgeous moment in the garden all summer – but along with the happiness, this electric moment of her blooming will be tinged with a bit of the sad. I think this is what makes agaves more than the next plant. They show us, in plant form, how a life can be lived – big, sharp, bold, take no prisoners, make no apologies, give it everything and then give even more at the end. It’s kind of awe inspiring, isn’t it? Much of my enjoyment in my garden is creating relationships between my plants, but the biggest relationship created is always the one WITH my plants. I love it when a plant can make me FEEL something -agaves do that ( and I’m not just talking about the poking and stabbing that all lovers of these succulents know all too well!). I am going to enjoy the HELL out of this bloomspike! It is going to be a thrilling journey, and I’ll honor my beautiful Agave desmettiana variegata ‘Ballerina’ (my nickname, not a trade name – yet!) by rushing out every day to see the rapidly growing spike and experiencing every moment of this incredible death! I am THANKFUL for the beauty surrounding me; the seeds germinating and volunteering where they will, the aloes getting ready to put on their yearly show, the leaves carpeting the ground with beautiful, subtle colors – and the passing of another favorite plant in the most life affirming of ways! You’ll be sharing this bloom with your readers too, I hope. Not to mention if you have too many pups I know where you can get rid of a few! You have a wonderful Thanksgiving! If Ballerina’s bloom spike lasts half as long as some local AD I’ve been watching, she’ll be dancing for a a while still, maybe six months! Thanks for sharing your thoughts here Ivette. A beautiful post! Hi Denise – these spikes are such events, because they last so long. If you HAVE to go, it is a brilliant way to just EXPLODE out of this world, right? Scott! Fearless leader! Thanks for your lovely comment, I take it to heart. XO!!! i get so excited when i see a bloom spike. but there’s always that “circle of life” lesson that goes along with it. can’t wait to see the giant flower! they always feel like a gift. thanks! Oh, I love it when they bloom! The big ones on the other hand, are kind of a pain when you have to remove the huge inflorescence. I absolutely love the architectural photo that you shared! The agave americana at the Chicago botanic garden recently bloomed and then passed. You put the feeling into just the right words! They’re like old friends, and although we miss them, it’s wonderful to see them fulfill their big genetic destinies and move on. You’ll have to throw a party in her honor! At least a virtual one. I’m so there! You really captured the feelings of appreciation, joy, and wistfulness (woe even?) 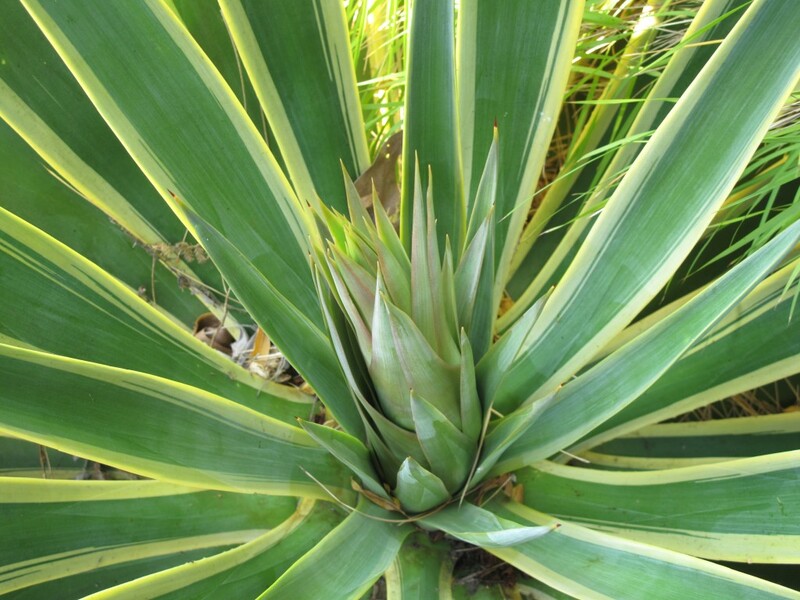 that a bloom spike on a favorite agave can engender. I’m watching my beloved Whale’s Tongue like a hawk, not really expecting a spike now that it’s cooler, but maybe next summer. When it happens it will be emotionally tumultuous for me. Remember the last time this happened to me…G? I have 275 empty small pots that I could immediately ship up to you OCD WILL set in. Your ballerina agave spike I am sure will be a show-stopper, pirouetting herself up to the heavens…keep us all informed of both her progression and her unfortunate demise and rotting of her 80′s Flash Dance leg-warmers. Mmmm! She will live on, naturally…but you better send a pup or two down to Austin though, right Loree? btw: You need to turn off those “emotions” in the Word-press settings!…It is making me look even more ridiculous then I actually profess and acknowledge myself to be! What a beautiful writer you are! I am going to forward your post to some of my writer and editor friends. What a beautiful tribute, Ivette! I’m feeling the same way these days as I’m watching my Tabletop Aeonium begin to mound in the center. For the past 2 years it’s been flat as a pancake, and now it looks 3 months pregnant. Just a hint of what’s to come. Soon to burst forth with a bouquet of little yellow flowers, then (gasp) the shriveling begins. It’s SO ‘Lion King’ isn’t it?